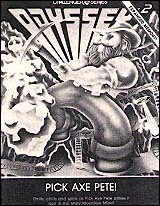 Signs and banners throughout Chicago's McCormick Place on June 6, 1982 proudly announced the Summer Consumer Electronics Show (SCES), a mammoth trade-only exposition of electronic gadgets ranging from $10 digital watches to home audio/video systems pushing $25,000. But this year, most of the 70,000 or so visitors to SCES would agree that the show was incorrectly named. It was really the Summer Video Games Show (SVGS). Even veteran game industry watchers were having trouble keeping up with all the new hardware and software companies and the designs of dozens of cartridges for the popular Atari VCS and Mattel Intellivision video game systems. As recently as January, it had been easy to get a handle on the industry. Hardware--game console--brands were the same as they had been for a couple of years: Atari, Mattel, Odyssey, and Bally's Professional Arcade under Astrovision's care (their name has since changed, as we'll see). On the cartridge end, only a few outside companies were on the scene, trying to fill the slots in an estimated 6 million Atari VCS consoles. Activision had started the idea of supplying cartridges as a third party supplier (i.e., cartridges not made by the console manufacturer) in 1980. January 1982 saw a few new brands trying to get in on Activision's successful act. Games by Apollo and Imagic demonstrated a total of five Atari-compatible cartridges in various stages of development. And Coleco announced, but did not display, 9 Atari and 11 Intellivision games due later in the year. Then came the Toy Fair in New York in February, and more action. Parker Bros announced Atari cartridges, as did CBS/Gabriel and even arch-rival Mattel. Coleco did one better: in addition to the cartridges announced earlier, a completely new console system was shown for the first time. Since then, more new products than you can shake a joystick at have surfaced. The SVGS brought to light prototypes or announcements of about 90 new Atari-compatible games (by my count) from 17 companies, if you include Atari. 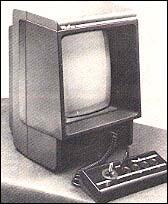 Lots of new names, too: Arcadia CommaVid, Data Age, Fox, MCA, Spectravision, Telesys, Tiger and Vidtec. And then there was a parade of new console systems, like working versions of Atari's new 5200 advanced system and Colecovision. 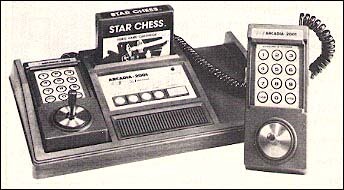 Astrovision renamed both the company and its old Bally system to Astrocade. Entirely new systems by Emerson, Video Technology of Hong Kong, and General Consumer Electronics (GCE), kept show goers busy zapping and beeping. Now, on to a catalog of details and some first-hand impressions from the 1982 Summer Video Games Show. 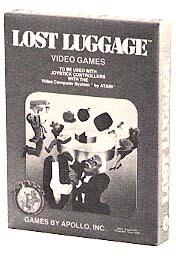 The company that started the Atari craze was present with several new cartridges for the VCS, as well as with plans for even more in 1983. Arcade themes on display were limited to previously announced Defender and Berzerk: the first, a wonderful VCS adaptation of one of arcade-dom's most complex and macho favorites; the second, a graphically faithful, reproduction that is rather uninteresting in play value. There was a noticeable emphasis on video adaptations of adventure type games. That's adventure with a small "a"--what I saw bears little resemblance to Atari's popular Adventure cartridge. One series is under the SwordQuest banner, and will be supported by clue-filled comic books designed for each cartridge by DC Comics. EarthWorld, the first to become available, in October, features 12 zodiac rooms with doors containing clues for the hunter. Action sequences are thrown in to add to the difficulty. Experience in EarthWorld is said to prepare you for the second release, FireWorld. Two more games, AirWorld and WaterWorld, feed on your knowledge of the first two, and are scheduled for 1983. This series will appeal to the dedicated video gamer---or may convert dyed-in-the-wool fantasy role-playing gamers to video games. Another adventure style game, due in December, will be based on the movie Raiders of the Lost Ark. Atari is promising to pack this cartridge with a new computer coding scheme that crams more graphic detail onto the screen than we have seen before. In this game, we will be guiding Indiana Jones on a treachery-filled trek through 13 rooms to recover the lost ark of the covenant. Sports fans will see a series of redesigned sports cartridges: Baseball, Volleyball, Football, and Soccer. Only Baseball was on display--or rather, just the screen of the new field and players. It was, indeed, an improvement in graphics over the first generation. Actual game play has yet to be seen, but will surely be a welcome addition for sports-starved VCS players. Younger players will probably enjoy a frogs vs. flies game tentatively titled Frog Pond. Two frogs vie for the highest number of flies by Jumping and catching the insects with their tongues. If you have seen Intellivision's Frog Bog, you get the picture. 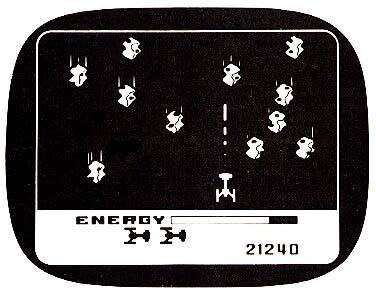 Other Atari-made games introduced included Demons to Diamonds (an average activity that is a cross between Space Invaders and the arcade Centipede on an old Atari Football field), Fail Safe (tank battle) and a VCS version of Atari's outstanding 400/800 computer game, Star Raiders. I doubt that there is an active VCS owner who doesn't have at least one Activision cartridge in his library--probably Freeway or Kaboom. Well, move over guys--here comes another very original cartridge no VCS should be without: Activision's Pitfall!, subtitled, Pitfall Harry's Jungle Adventure. Your job is to guide Pitfall Harry through a series of danger scenes (256, different ones, I heard) in search of treasures, while dodging any number of hazards. You need coordination to grab and swing on a vine across tar pits, jump over logs, walk through swamps by carefully stepping on closed-mouth crocodiles . . . and on and on. Underground passageways may help, until a scorpion or brick wall gets in the way. Graphic detail is startling for the plain ol' VCS, and the play is not something easy to master--the time limit for a search is twenty minutes. Amid all the Atari-compatible cartridge hoopla at the show, this game was a standout. Activision's other Atari introduction, Megamania, is called a Space Nightmare--but it's more like a Space Invader's Nightmare. Instead, of fighting off descending alien creatures, you must shoot at colorful objects like hamburgers, radial tires, dice, irons, bow ties, etc., as they descend to the bottom of the screen. One extra game element is an energy gauge, which runs out if you let too many "invaders" reach ground level. Imagic, makers of the graphically well-executed Demon Attack, continued to demonstrate its graphics prowess with four interesting-looking Atari cartridges. On the space front, Atlantis displays a detailed underwater city under attack by various spacecraft. You start out with three lasers on the screen--one in the center shooting straight up, and one on each side of the screen shooting diagonally across the screen. The joystick selects which laser you want to fire at the spacecraft flying by, and the red action button shoots. Of course, the aliens are not passive: they are trying to bomb your lasers and other Atlantis targets. Reaching high score levels helps replenish your destroyed installations. Offering more intriguing game play is Imagic's new Cosmic Ark, alternating two-part space encounter. Scene One puts you in charge of the Ark, a large space ship in the center of the screen. Enemies attack from each of four sides. You must respond quickly by moving the joystick in the direction of the on-coming missile and shoot. Once through a wave, the scene changes to a planet surface. The Ark descends partially. While it hovers, a smaller roving craft disembarks on a time-limited challenge to beam up two of the critters on the planet (Ark, get it?). At higher levels, this becomes difficult as a deadly ram beam scans over the planet surface seeking aliens such as you. A buzzer sounds, and you must high-tail it back to your mother ship before a meteor comes crashing out of the sky to obliterate your only means of escape. In many ways, this is a turning-of-the-tables on the Defender theme. And it's a winner. Another Imagic creation features an adventure type game set in the Egyptian Valley of the Kings, called Riddle of the Sphinx. You will need some time to learn how to recognize all the characters and their powers or threats. Fire Fighter is fun to watch, and will probably delight the kids. The scene is a burning high rise building with a frantic woman running from window to window just out of reach of the inferno. As the firefighter, you put the fire out with your hose and maneuver a hook and ladder to rescue her in the shortest time possible. Parker Bros, the people who bring you Monopoly and Merlin, are also setting sights on your VCS console slot with a growing series of cartridges based on either popular arcade games or other licensed properties. The Empire Strikes Back--a game that takes some getting used to before you feel challenged--and a remarkably true-to-arcade Frogger are the first two titles. There is always a hazard in trying to reproduce a well-known, high-resolution arcade game on the low-resolution Atari VCS (or any system using a color TV as a display), but Frogger is one of the most detailed translations I have seen. The most noticeable difference in game play is that you have the advantage of a wraparound screen. If Frogger is on a log moving to a screen edge, he will reappear unharmed on the opposite side of the screen. Announced, but not on display in VCS form, were upcoming Parker cartridges for Amidar (both playfields are planned), Super Cobra, Tutankham, Reactor (this will be a VCS designer's challenge, to be sure), Sky Skipper, and a Spiderman adventure. One of the industry surprises this Spring was Mattel's announcement of its intention to produce cartridges for the Atari VCS. At the SVGS, I had an opportunity to see screens of the initial library of eleven games in Mattel's M Network series. All cartridges parallel already successful Intellivision cartridges or ones about to be released. Most of the names are changed on the M Network versions. For example, Astrosmash is Astroblast for the VCS. Game play is identical. I thought it would be easier using the Atari paddle controllers then the Intellivision direction disk. But, with only a few minutes of play time, I found it not as easy to advance to higher levels--possibly because the falling objects come faster than on the Intellivision version. In any case, this and other Intellivision translations will be welcome library additions for those who were torn between the VCS and the Mattel system and chose the VCS. The remaining cartridges (with Intellivision parent title in parentheses) are: Space Attack (Space Battle), Super Challenge Baseball (Major League Baseball), Super Challenge Football (NFL Football), Armor Ambush (Armor Battle), Frogs and Flies (Frog Bog), International Soccer (NASL Soccer), Lock 'N' Chase (same), Dark Cavern (Night Stalker), Sea Battle (same), and Tron Deadly Discs (same). Taking a purely original game design route is Games by Apollo. On display were four new cartridges: Lost Luggage, Racquetball, Shark Attack, and Space Cavern. Lost Luggage has a cute story line: an airliner lands, and shortly thereafter, luggage starts coming around the baggage claim carousel. But it's running too fast, and luggage goes flying everywhere. You must catch all the pieces before they hit the ground. If one hits, they all open (like Kaboom's bombs going off) with various personal articles, ranging from combs to brassieres, falling to the ground. Each "wave" is a new planeload of luggage. The graphics are fun to watch, but the game play for experienced players gets old fast. Your screen character, which can move up and down as well as across the screen, has too large an area (about half the screen) to cover for a very random assault of luggage. This cartridge falls into a rapidly growing category of games intended for a broader, family audience. Racquetball takes a difficult-to-reproduce game and makes it almost impossible to play. To help you determine the position of the ball in the enclosed court, you have two ball shadows--one on the floor, one on a wall. From only brief play at the show, I never felt in control of my screen player, as far as getting him lined up to take an automatic swing at the ball. Most of my points were scored by accident. Action games like this should be a little easier to get into. In an apparent "can't lick 'em, join'em" move, three large entertainment companies who had feared erosion of movie and television audiences to video games, launched video game efforts of their own. At the show, MCA (parent of Universal Pictures and Universal Television) simply announced that MCA Video Games Inc. will develop cartridges "in all systems for the home market." We can expect many titles to bear likenesses to action movies and TV shows, but releases won't come until 1983. They are also looking into game possibilities using the capabilities of the laser videodisc--an exciting prospect, indeed. A more concrete announcement came from CBS, who will issue cartridges through CBS Video Games, a division of CBS's Gabriel Industries (the toy and game maker). In CBS's hip pocket is an arrangement with Bally, whereby CBS will have the video and computer game rights to new Bally arcade games for the next four years. Two Atari-compatible cartridges should be out this year (probably Wizard of Wor and a four-screen version of Gorf), with more cartridges and other game formats to follow in 1983. If Warner and MCA can do it, so can Twentieth Century Fox, with its new company called Fox Video Games. Four brand-new games developed by veteran computer game creator Sirius Software were on display: Deadly Duck, Beanie Bopper, Worm War I, and Fast Eddie. Of the four, Worm War I and Fast Eddie should appeal most to the experienced gamer. Worm War I, written by former Creative Computing Associate Editor David Lubar, is a raucous venture down a dark, vertically scrolling playfield. Colorful side barriers provide a feeling of movement. Waves of worms come into view in images reminiscent of a Star Tek transporter materialization and wriggle like inch worms across the screen, as they scroll toward the bottom of the screen. Worms you don't shoot reappear at the top of the screen in a different color. The "catch" is that you have limited fuel (displayed as an ever-decreasing number) which can be replenished only by speeding through gas stations that appear at random amid the materializing worms and barriers. The more momentum you get before going through the garage, and the more accurate your aim through the opening, the more energy you collect. Garages, however, are frequently surrounded by the worms and barriers you are trying to shoot. Errant shots destroy the gas station--and your chance for a recharge on that wave. Fast Eddie at first looks too cute to be a serious game. Eddie is faced with five floors connected by ladders. On each screen, Eddie must jump to grab nine objects without being touched by creatures, called Sneakers, which vigilantly patrol each floor (you can jump over Sneakers, by pressing your fire button). Objects appear only two at a time, and replacement objects appear at random forcing Eddie (you) to climb up and down to all levels to pick up enough objects. By the time you grab the ninth object (the points for each successive object flash for a second where the object originally appeared on the screen), the one Sneaker, called High Top, who guards the top floor, is short enough to jump over. Get your Fast Eddie up to the top floor, successfully jump over High Top, touch the key he carries, and you are on to the next difficulty level. Each of the eight progressively difficult levels (featuring more and/or larger Sneakers making jumping a trick) contains five or six screens--providing a lot of play time for the experienced player. If I had not seen it with my own eyes, I would not have believed that the Atari VCS could be "supercharged" with a plug-in device to increase graphic resolution. But Starpath Corp. sure seems to have done it. Moreover; the games are contained on low-cost audio cassettes, loaded through a tape player. Starpath's Supercharger ($69.95, including one cassette) looks like an extra-long game cartridge that plugs into the slot on the VCS console. A wire coming from the Supercharger case goes to the earphone jack of a cassette player. Taped programs ($14.95 each) load into the expanded RAM of the supercharger (6272 bytes vs. 128 bytes in the VCS) just like a microcomputer program. The additional RAM enlarges the amount of screen/graphics information that can be stored (or "dumped," if you will) onto the TV tube. It allows, in the end, the graphics generator to scan every line of the TV screen, instead of repeating an image for two lines, as the VCS does by itself. The balance of the RAM is left for program instructions which normally come from the plug-in ROM cartridges. The graphics are something else. On one tape, Phaser Patrol, you are in a Star Raiders/Starmaster environment, with two screens of action: a galactic sector map and a cockpit action screen. But it is the detail of the instrument panel that shows how much improved the resolution is. Small letters and numerals are easily readable, and a fascinating clock has very small, yet distinct elements. I also saw some scenes from a maze game that was still under development. The view was that of walking down corridors. Diagonal lines receding into the distance were among the smoothest (i.e., little noticeable "stair-stepping") I have seen on any home video game system. The Phaser Patrol cassette is shipped with the Supercharger. Other titles announced are Communist Mutants From Space (a Space Invaders variant), Fireball, and Suicide Mission. At the heavily guarded Coleco booth, only one of the company's nine Atari-compatible cartridges was on display--and a very interesting display at that. Set up side by side were Coleco's three versions of the same game, Donkey Kong--in Atari cartridge, Intellivision cartridge, and Colecovision cartridge forms. Although I probably could have spent an hour comparing the three, my initial reaction is that the Colecovision takes the top prize in arcade realism (see Colecovision report below), followed surprisingly by the Atari and Intellivision, in that order. In this case, arcade realism is judged not in terms of graphic resolution, where, of course, Intellivision beats the VCS by a mile, but in terms of pleasing reproduction. Looking at the two screens, the VCS was more inviting. 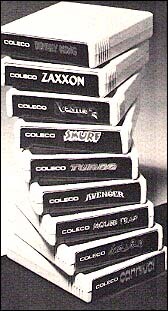 If Coleco does as well with the other VCS cartridges (Venture, Cosmic Avenger, Mouse Trap, Lady Bug, Carnival, Smurf, Zaxxon, and Turbo), there could be some tough decisions to make at the cartridge counter. All sorts of new company names surfaced on the Atari-compatible front. 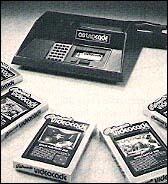 Vidtec is a new brand offered by U.S. Games Corporation, which is a newly acquired subsidiary of the Quaker Oats Company. Got that? If not, don't worry. Vidtec is the name that will appear on the cartridges. The announced opening library is a collection of eight varied titles, practically all dedicated to family play, rather than ultra-macho themes. Two are intended for the very young. Sneak n' Peek is a video hide-and-seek with interesting cartoon graphics of rooms inside a mansion. Word Zapper is a clever educational game that combines a memory/spelling drill with a shoot em-up arcade game. No manufacturer's library can be without a space game, and Vidtec's is Space Jockey, previewed at the January Consumer Electronics show. In this one, you are the space ship, fending off helicopters, balloons, planes, and ground tanks scrolling at you horizontally across the screen. Commando Raid is another shot-'em-up, with parachuting commandos trying to land and capture your ground gun. Weird Bird is a Kaboom variation, in which you must catch falling eggs before they splat. But you also have a chance to shoot at the birds. 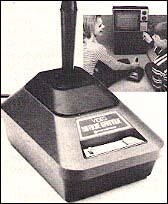 Other Vidtec titles include Towering Inferno, Gopher Attack (they could have used this game and its Gopher Bonker in the movie Caddyshack) and Maze Chase. A fast-paced maze game called Jawbreakers (licensed from On-Line Systems) is one of five titles introduced by Tiger Electronic Toys' new Tigervision line of cartridges. You may have seen Apple and Atari computer versions of this game, but the VCS version is much different. In this one you control candy-bar-eating teeth (like the wind-up clattering novelty) up, down, and across a series of fast-moving horizontal lanes. Occasional breaks in the lanes let you jump from one to the next as you try to avoid smiling faces (like Berzerk's Evil Otto) that race down the lanes after you. When you clear the screen of candy bars, you pause while a colorful toothbrush comes out to keep you cavity-free. The balance of the library includes King Kong (licensed from the movie, and reminiscent of Donkey Kong in play), River Patrol, Marauder (robots in a maze) and Threshold (a space fight game). CommaVid is another new name on the cartridge scene, presenting four new games for the VCS: Cosmic Swarm, Room of Doom, Mission Omega and Mines of Minos. Cosmic Swarm is an appealing game because there are several things going on at once--a combination of strategy and shoot-'em-up skill is needed. The instructions relate an overly detailed and unnecessarily confusing scenario for the game, in which "metal-munching termites" crawl out from the top of the screen at random, each carrying a square block. They lay these blocks at random around the play area. You are in command of a small space fighter (with Asteroids-like rotation and thrust movement, but no hyperspace) charged with keeping the play area clear. To do this, you must hit a block in a very precise spot, while a termite is still carrying it. All the blocks on the playfield then turn from green to red. While they are red (energized), your laser can destroy them one-by-one. But if a termite should start after you (and it will! ), you may be forced to shoot it in self-defense, which will cause all blocks to turn back to the impenetrable green. As soon as you think you have everything under control, you hear a buzzer that warns that you need to refuel by docking briefly with a fuel ship which appears along either the left or right screen edge. This gives the termites time to lay more blocks. If the termites succeed in building a wall of green blocks between you and the fuel ship, you are in big trouble. The game will not win any awards for graphics, but the action-strategy combination makes Cosmic Swarm a likely prospect for your VCS library. If you are the proud owner of Mattel's Intellivision system, don't be discouraged by what seems to be trainloads of support only for the Atari VCS. Apparently, there are enough Intellivision consoles in use to attract several independent cartridge designers. Activision, the multi-award winning developer of many of the most captivating cartridges for the VCS, featured two Intellivision adaptations of their Atari titles: Stampede and the new Pitfall! (see review above). I had expected to see some dazzling graphics for these Intellivision translations--but such was not the case. In Stampede, for example, the cowboy/ horse and "dogies" were scarcely more detailed than their Atari ancestors. 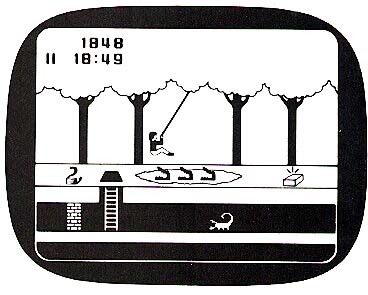 And in Pitfall!, where the Atari version went to great lengths in exploiting graphic detail, the Intellivision screen offers only a couple of readily discernible refinements. In conversation with Thomas Lopez, Activision Vice President of Editorial Development, I learned that the intent of these two cartridges was simply to bring the game play of two top Activision games to Intellivision users--games they would otherwise not be able to play. He assured me, however, that the company was at work on original Intellivision cartridges that will take advantage of the graphics capabilities of the system. Over at Imagic, exciting things were happening with Intellivision cartridges. Their popular Demon Attack has been translated to the Intellivision format with the added excitement of a mammoth Mother Ship. Atlantis, a new game on the Atari side is also available for the Intellivision, with greater detail added to the graphic elements above and below the water line. An adventure game, Swords & Serpents, was shown only for the Intellivision, as was probably the most graphically unique game playable on the Mattel: Micro Surgeon. In this unusual game, the video screen acts as a color x-ray into a human body. You see all kinds of blood vessels and internal organs as you move the view all around a body. The view is equivalent to about one-quarter of the head, and scrolling in all directions is smooth, slow and precise. Your mission inside a microscopic vehicle is to clear the body of tumors, bloodclots, nicotine deposits and a mean tapeworm--while dodging the white blood cells who see you as a foreign matter. From preliminary play, this cartridge looks like a "must" for Intellivision owners for both graphics and unique game theme. The absence of arcade-derived games for the Intellivison will be partially filled by Coleco's new Intellivision-compatible cartridges. The initial lineup includes Donkey Kong, Venture, Cosmic Avenger, Mouse Trap, Side Trak, Rip Cord, Lady Bug, Carnival, Zaxxon, and Turbo. Only Donkey Kong was working at the show. Most of the original game elements were there for at least the first board (ramps) but the color seemed to lack the punch of the original. This may be a limitation of the Intellivision system itself, so I will withhold judgment until I see Coleco's other cartridges. You can expect to hear more from other cartridge makers about Intellivision cartridges in 1983. The momentum is tremendous. Of course, Mattel was there, too, showing more finished models of games announced in January, plus a more substantial display of Intellivoice, the plug-in speech synthesizer for the unit. Cartridge emphasis was placed on games that can be played solo, as well as by two players. From the regular cartridge additions, the most desirable ones seem to be strategic games. Reversi and USCF Chess are obvious choices if you are partial to those traditional board games. Utopia is a simulation of building a civilization on an island while responding to the destructive forces of Mother Nature. And the card shark gets a load of new games for video in Royal Dealer: Hearts, Crazy 8's, and Rummy can be played against one, two, or three computer-controlled opponents. On the action side, Sub Hunt puts you in command of a sub out to sink enemy ships. Your screen gives you views of both your periscope sights and a reconnaissance satellite scan of the overall situation. Two action games based on the Tron movie place the hero, Tron, in activities called Deadly Discs and Maze-A-Tron. The Intellivoice add-on module is exciting--not because it is a speech synthesizer, but because the initial games designed for it have made the voice an integral part of game play. Of the four cartridges announced (excuse the pun)--Space Spartans, Bomb Squad, B-17 Bomber, and Tron Solar Sailor--B-17 Bomber is my favorite. Three different screens, a realistic aerial view of assorted targets below, the sight of bombs falling away and getting ever smaller until their explosions puff on the landscape, and the voices ranging from a John Wayne imitation to a good ol' Georgia boy bombardier--these make the game most appealing. While you are bombing a target, one of your crew members alerts you to bandits coming in at a specific angle--it is time to shift screens to do battle. Fabulous. 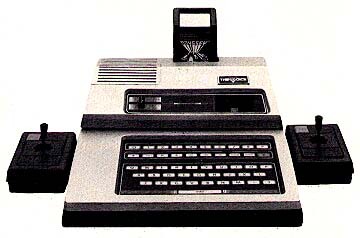 The only video game to sport a full typewriter keyboard, Odyssey2, featured working examples of its add-on speech synthesizer called, simply enough, The Voice. The module sits on top of the Odyssey2 console-blending well into the contours of the 02--and connects to it by way of the game cartridge slot. A volume control is provided since, unlike Intellivoice (above), the speech comes through a speaker in the module, rather then through the TV. Voice titles are: Type & Tell, S.I.D. the Spellbinder, and Nimble Numbers N.E.D. It was also announced that popular Odyssey2 cartridges such as UFO would be re-issued in the future to take advantage of the voice. While the voice quality is good (using the General Instruments speech chip set), the voice is not well integrated into the play of the cartridges--it supplements the activities, but does not add a dimension to the game. In fact, I learned from Dave Arganbright, Vice President and general manager of Odyssey division (it no longer is part of Magnavox, but its own division of NAP Consumer Electronics Corp.) that voice cartridges will be compatible with the Odyssey2 unit alone, so the voice is not likely to be the key element of a cartridge. To me, that eliminates any incentive to buy the $100 voice module. Odyssey revives their popular (until Atari pulled the plug) K.C. Munchkin character in a new cartridge called K.C. 's Krazy Chase. Pick Axe Pete is a new character in an adventure-type journey through caverns and the like, in search of a gold key. Perhaps the best Odyssey news is, that Imagic is scheduling the first independently produced Odyssey cartridges for 1983. It will be most interesting to see how fresh program approaches will be executed on the Odyssey2. Astrocade is now the name for the deluxe home video game that started life as the Bally Arcade. The company changed its name from Astrovision, probably to keep it from getting confused with Activision, the Atari cartridge developer. By any name, this unit has one of the best graphics and sound packages of any home video game, and some new cartridges that really show it off. The Incredible Wizard is an incredibly good replica of Bally's Wizard of Wor arcade game. From the opening music to the between-wave screen announcements of double or quadruple scoring to an arresting light and sound show for blasting the speedy Wizard, I will take the Astrocade version over the arcade anytime. Among other new action cartridges like Solar Conqueror, Cosmic Raiders, Conan the Barbarian (adventure type game), or Pirate Chase, the cleverest graphics award goes to Artillery Duel. The cartridge is less of a game, per se, than it is a visual delight-something you would throw into a projection TV at a party. At the outset, a randomly selected battlefield is drawn on the screen, with a gun emplacement at each side. A small platoon of soldiers (your guys) march up to your gun. Digital indicators from a control panel display your settings for elevation and amount of powder for the next shot. Another digital display shows the wind direction and speed. Then, an amazing color reconnaissance camera is focused on the enemy gun--you see the color monitor on the panel. To add a bit more realism, the TV image flickers occasionally. A direct hit or enough near misses cause the enemy gun to blow to smithereens, blackening its entire hillside. Your victorious platoon leaves its gun, marching away in formation. It is really a graphics showpiece with a little bit of player interaction thrown in. Lest you think the trajectory data is arbitrary, Astrocade advises that the game designer is a consultant to the U.S. Navy on computer programs for fire control weapons and missile systems. Two new Astrocade cartridges may inspire the artist in you. Creative Crayon is a sophisticated graphics generation program that lets you create colorful shapes on the screen with a light pen. Music Maker lets you explore the three-voice music synthesizer of the Astrocade, with music notation showing on the screen. With both cartridges, you can store data on cassette tape for playback later. If the Emerson brand name rings a bell, it is probably from a portable radio or other electronic entertainment product. This year, Emerson also means video games, with the introduction of the Arcadia 2001 video game system. Priced in the Atari VCS range, the Emerson unit is scheduled for an initial release of 19-cartridges (incompatible with other systems), followed by at least four more. Graphic resolution of the games on display was similar to that of the VCS, and our overall impression of the game play was favorable for a system in this price range, though no cartridge stands out as being an exciting original creation. Of particular interest to me were two unique hardware design features that the "big guns" should note. First of all, there is a red LED which shines when the power is on. How many of us have left our consoles on overnight because we turned the switchbox back to "TV" and forgot to turn off the console? Secondly, the Emerson joystick-keypad controller is designed so you can use the direction control either as a disc (as on the Intellivision) or as a joystick. A great idea. Just as the world became accustomed to programmable (i.e., plug-in cartridges) video games, Entex offers a low-cost alternative: a dedicated video game. For about $65, you can buy a Video Space Battle, a space invaders type video game whose console looks like an oversized joystick controller, and hooks up to your TV set. The unoriginal game play aside, the tall joystick with top-mounted fire button, all on a wide base, makes for an appealing game controller. It has taken longer than I expected, but more video game accessories appeared at the show. Of course, there have been several console covers with built-in cartridge holders (though they tend to hold less than 25% of the cartridges you own), and some of the cassette tape rack makers had adaptations for video game cartridges. There was more excitement, however, in the area of accessory controllers. A simple, yet very practical kit for the Intellivision is a product called Injoy A Stick (from Laskey Video Distributing). Following very simple instructions on the package you swap the Intellivision direction disk for a replacement disk that also has a joystick in the center. Injoy A Stick will cost under $10 per pair. Cynex Manufacturing Corp. displayed a prototype set of wireless joystick controllers for the Atari VCS. 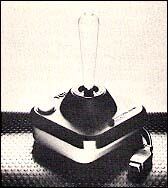 Each joystick unit of the Game-Mate II has a telescoping whip antenna to communicate with a control box plugged into the VCS console. Rated range is 20 feet. Working with the prototypes, I found the reaction time, a critical factor on high speed action cartridges, to be slow, but a company spokesman said that the design was not yet finalized at the show. Target price for Game-Mate II is $79.95. Anything that can eliminate a dangling cord or two without sacrificing controller response time will be welcome. You may not know the name Wico, but if you had ever played an arcade game, there is a good chance you have had your hands on a Wico joystick controller. Now, the company is branching out into the Consumer field by packaging their commercial quality game controls for home video game use. Even their standard joystick gave me the feeling of more control than any other factory supplied Joystick. The unit has two action buttons, one at the upper left corner of the base and one at the top of the joystick--select one with a slide switch on the base. Other models to come include a deluxe version with a larger base, a "red-ball" type joystick and a trackball controller. Adapters will also be available for Odyssey2 and several home computers. Wico has also solved the too-short-cable problem for the Atari VCS (or 400/800 computers). Six- and twelve-foot extension cords will finally let you sit back and play Atari. You don't have to be a video game buff to see that the field is exploding with new companies and new products. The difficulty lies in making selective choices, either in new hardware or in software to support the machine you own. It is no longer practical---or possible for most to own the majority of cartridges available for the VCS. And it is getting that way for Intellivision, too. In choosing a new system, the controllers play a big role in your enjoyment of the games. The best graphics in the world won't help if you are always uncomfortable operating the controller. Next, diversity of the cartridge library game play is important. The available games should cover a wide range of sports, space, fantasy, arcade, and the category of original games you use to introduce non-gamers to your addiction. The library should contain cartridges that really challenge the skilled player as well--and an ever increasing number of cartridges with fresh graphics, sound and game play, instead of re-hashing earlier games. Selecting software for your existing system is more difficult, because individual tastes come into play, as in records or movies. But whether you are an arcade freak, a fantasy role player, a sports nut, a family cartridge devotee, or a hand-eye coordinator expert, there are plenty of cartridges to go around. Try to play the games before you buy them. Read the instructions, if they are available, to make sure the game has the challenging elements you want, or is fun for the whole family, as the case may be. And lastly, look to future issues of Video and Arcade Games for both hardware and software reviews, plus news of what is going on in this fastest paced home electronics industry. Better than the previous one. Space battle a la Star Raiders. Avoid the cats in the maze. panels that open and close. Grab cubes in a labyrinth. 3-D realism, I or 2 player. 1 or 2 player maze game. Cross a highway and river. Dumb hide and seek game. Bop gophers on the head. 6400 W. Gross Point Rd.